When looking for the best baby sun hats, there are a lot of fun options out there to keep your baby safe from the sun’s harsh rays! Sun hats are great for wearing on the beach, in the backyard, or on the playground! We’re bringing you 10 of our favorite hats that are inexpensive, effective, and look adorable too! Before you start shopping, here are just a few things to consider when buying a sun hat for your little one! Age: Finding the right fit for your baby sun hat can be tricky! Some hats are sized by head circumference. Others are based on age in months or years, which can be used as a guideline to find the perfect fit. Material: You can choose the material based on activity or look you’re after. Polyester hats are lightweight and great for playing in the water because they dry quickly. Cotton hats are soft, comfortable, and look great while playing in the yard! 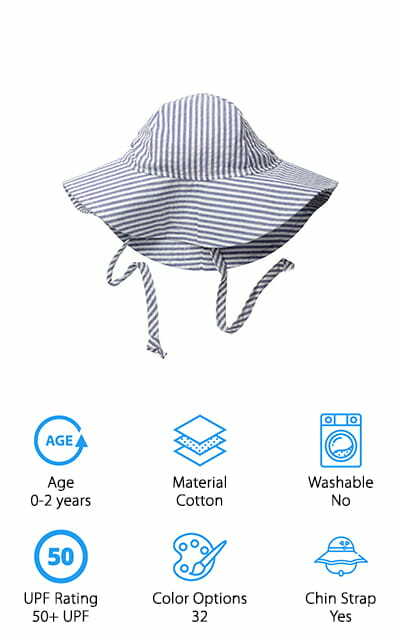 Machine Washable: If your child gets dirty a lot, a machine-washable sun hat will save time after a day at the beach! We also reviewed some hand-wash hats that stay soft and keep their shape well after a scrub in the sink! UPF Rating: Sun protection is important, especially for babies! The Ultraviolet Protection Factor (UPF) tells you how much of the sun’s UV rays are blocked with each hat. The higher the UPF rating, the less sunlight is able to permeate the hat. 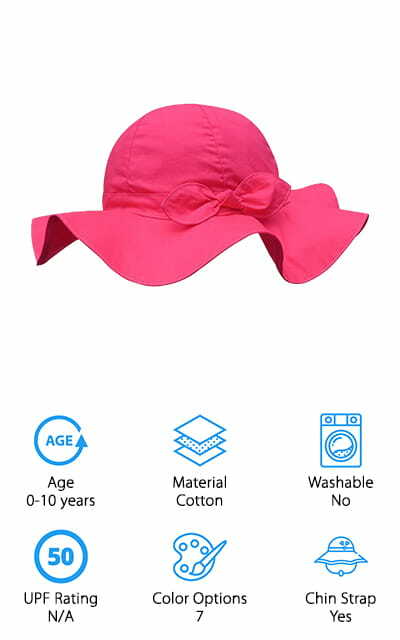 Color Options: Looking for a cute hat to match your toddler’s swimsuit? We found hats in a wide variety of fun colors and cute patterns to match any style! You can even buy a couple different hat styles to switch things up! Chin Strap: Chinstraps keep your baby’s hat comfortably in place while they play on a windy day. A chinstrap is also great for babies who pull off their hats or young kids who like to run around a lot on the playground! Now you should have a good idea what type, size, color, and level of protection you need. We did research and found 10 hats that are perfect for just about any child, from newborns to bigger kids, too! If you’re pressed for time – and what parent isn’t – that’s fine! Start off by reading about our Top Pick and Budget Picks now, and come back when you have more time! It’s time to get into the baby sun hat buying guide! Our pick for the best baby sun hat comes to us from the Vancouver-based company Jan & Jul. 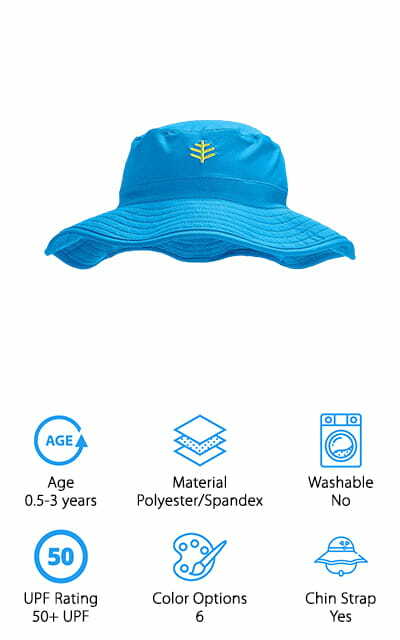 First, each hat is made of 50+ UPF, aqua-dry polyester to protect your child’s head from the sun while keeping cool! Another feature we like is the adjustable drawstring around the head! You can easily adjust this as they grow. This means you don’t need to buy a new hat every few months! Just size up a little, and tighten to fit until their head grows! We also like that it comes with a chin strap you can adjust to keep the hat on their head in the wind or keep your child from pulling it off. The safety latch on the chinstrap is a must, too! It snaps off in the event your child’s hat gets caught or pulled too tightly. Finally, with 12 adorable colors and prints to choose from, you can easily find one to match your child’s style! When searching for the best cheap baby sun hats, we wanted to find one that was inexpensive, yet still had a lot of the same features as our top pick – and we found one! This hat is made of 50+ UPF polyester for maximum sun protection, and it wicks away sweat and dries quickly if it gets wet. We also like that the brim on this hat is super wide and flexible, giving your baby’s face and neck some added coverage. The hat also has a toggle around the head, so you can adjust the hat to fit perfectly – and adjust it as your baby grows. Another great thing about this hat? It’s machine washable! Just toss it in the wash with your child’s clothes and beach towels, then hang it up to dry! It also comes in 12 bright, fun colors to match your baby’s clothes. Since they are inexpensive, buy a few different colors to switch things up! Looking for a crushable baby sun hat made of natural materials? This hat from Flap Happy protects your baby from the sun, looks adorable, and is made of 100% cotton! The hat has 50+ UPF protection, with a wide, floppy brim that keeps the sun off of your child’s face and neck. The soft brim also makes it easy to fold up in a diaper bag or beach tote! We like that the cotton fabric is thick enough to block the sun, but still lightweight enough to keep your baby nice and cool. The chin straps are easy to tie, and they keep the hat from blowing away or being pulled off. They also come in a whopping 32 different colors and prints, including mermaids, dinosaurs, flowers, and more classic stripes and chambray. We think these would make great sun hats to take to the beach or grab a white or striped design for church, weddings, christenings, or other fancy occasions! 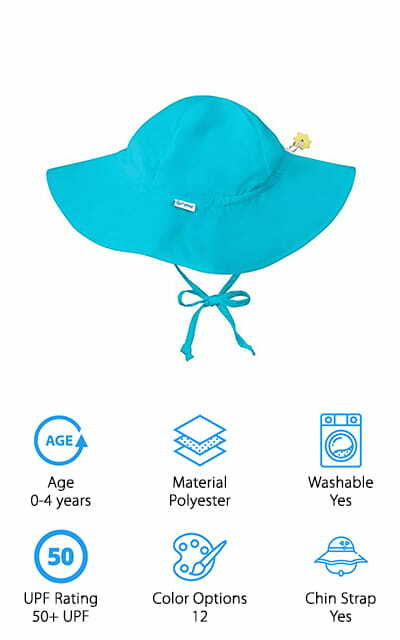 Next up is a toddler sun hat you can take with you to the pool, beach, or lake to keep your child’s head safe and sunburn-free! This hat from SwimZip is built a lot like an adult hiking/fishing hat. 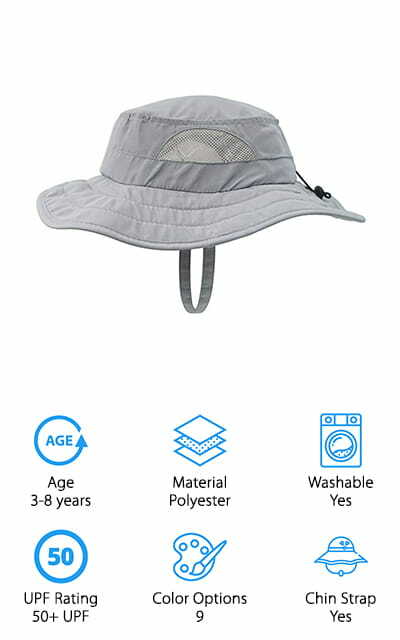 It has a wide, sturdy brim that protects your child’s head, ears, and neck from the sun. Oh, and the brim floats! No more worries about losing your child’s hat in the pool or lake! We also like that this hat has a toggle around the head to adjust the fit as they grow. There is also an adjustable chin strap with a safety clasp that will break away to prevent choking if the hat is snagged or pulled too tightly. It’s also machine washable and air-dries quickly, so you can keep their hat clean and ready for their next aquatic adventure! With 8 bright colors to choose from, you can grab a different color hat for each child in your family! This classic style of baby sun hat is a great gift idea for the new parent in your life! We like this baby hat because it is made by the same company as our top pick, and has a lot of the same fun features! This hat is made of 100% cotton, which looks great and will keep your baby protected from the sun and cool. We like that it has the same head toggle as our top pick, so you can adjust the hat as your baby’s head grows. No need to replace hats as often! We also like that the front of the brim is slightly thicker than the rest of the brim. It keeps the sun out of your baby’s eyes, but keeps the hat from flopping into their face! 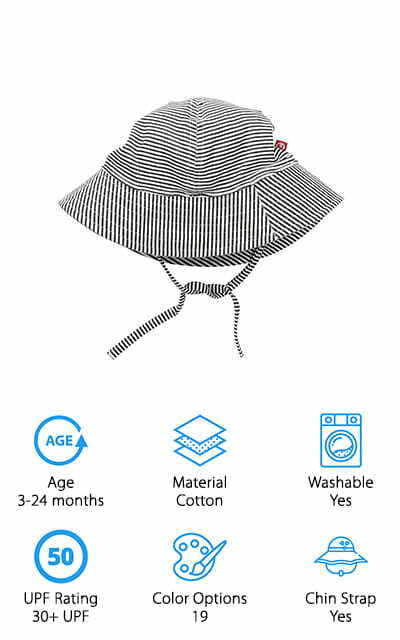 This foldable baby sun hat is perfect for tossing in your pocket or diaper bag for long trips to the beach or impromptu fun at the park! Looking for a cotton sun hat for your baby that fits in with a preppy look? These hats from Zutano come in a variety of classic solid and striped prints that give off a fun, nautical theme to your baby’s outfit! They are made of 100% cotton, which provides 30+ UPF protection from the sun, yet they are lightweight enough to keep your baby cool in the sun! It’s also a super soft hat, so your baby won’t mind keeping it on all day! The packable sun hat has a soft brim that is large enough to keep the sun off your baby’s face, and fits well if you have your baby in a backpack-style or ergo carrier! The chin straps are also made of the same soft cotton, which is easy to tie on and won’t irritate your child’s chin. This hat is also machine washable, so you can easily clean and air-dry it for another day in the sun! On our hunt for the best baby sun hats for sale, we wanted to find a variety of styles to suit any occasion, from casual beach days to formal parties and ceremonies. This hat is perfect for dressing up any little girl or boy’s outfit! We like that the fabric is soft cotton that not only looks great with any outfit, it’s also soft and gentle on your baby. This means they’re less likely to pull it off or get finicky when it’s on! The chinstrap is Velcro, so you can secure the hat for a proper fit. The Velcro is also a great safety feature, too! If your child’s hat gets caught on something, it will easily tear off to prevent injury. There are 7 different color options, and each one has a pretty ribbon and bow around the brim for some added cuteness! We think these make great hats for birthday parties, family events, weddings, holidays, and more! 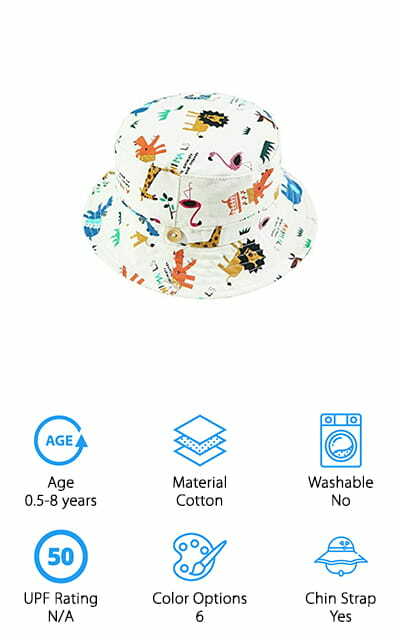 For the outdoor lover and safari adventurer in your family, pick up one of these absolutely adorable safari-style hats from Connectyle! 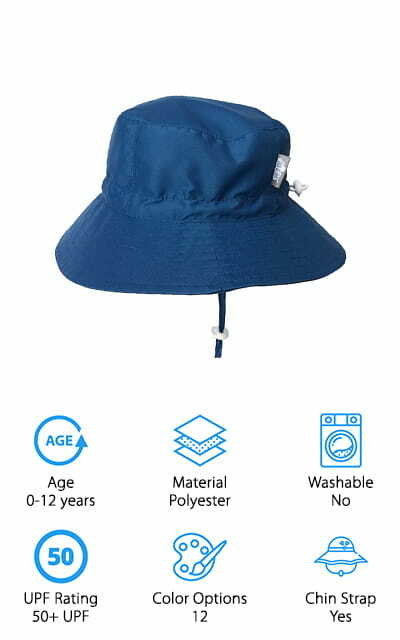 Your child will love looking for bugs, swimming in the lake, hiking, and more in this comfortable polyester cap! The fabric is lightweight and breathable with side vents to keep their heads cool on hot days. It also provides 50+ UPF sun protection to keep their faces, necks, and ears safe from the sun! We also like that there is an adjustable head toggle to get the fit just right. The hats are built for kids 3-8 years old, and they grow with them! The Velcro chin strap is perfect for young kids who already know to keep their hat on in the sun. It is easy for them to attach themselves, and comes apart easily if snagged or caught on something. They come in 9 different colors, so your little bug hunter and outdoor adventurer can play in style! If you’re looking for a durable sun hat that will take your baby from the pool to the ocean without fading, grab one (or a few) of these great sun hats from Coolibar! They are made of a polyester and spandex blend, which is both chlorine and saltwater resistant. This means you can take them in the pool or in the ocean without worrying about the fabric fading or wearing out! We like that these hats have a little stretch to them, which makes them super comfortable for your child to wear all day. 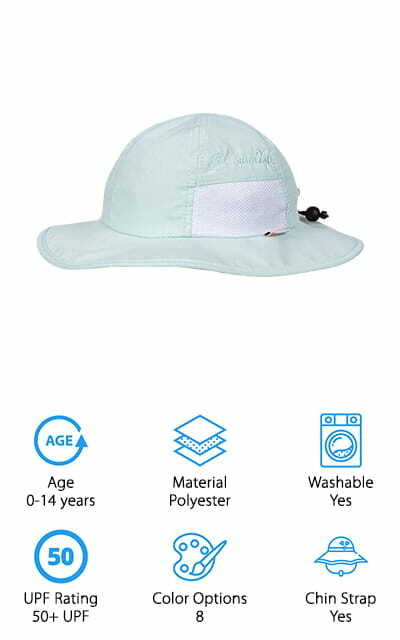 The brim is nice and big, and it gives your little one 50+ UPF protection from harmful UV rays. To keep them cool, the fabric is lightweight, and there is a moisture wicking terry sweatband around the inside to keep their heads dry and cool. The hat is easy to fold or crush up, so you can travel with one in your bag at all times! 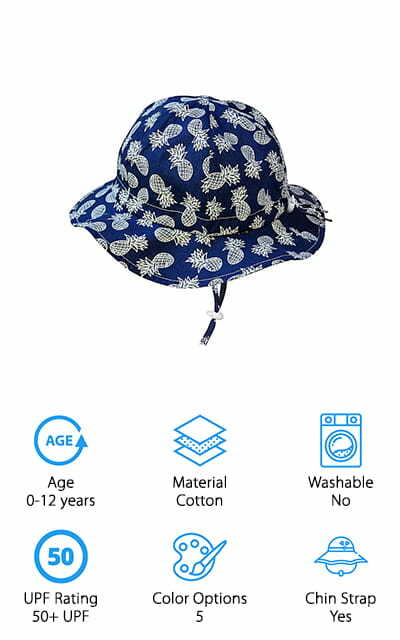 We end our baby sun hat reviews with this adorable bucket hat from Eriso! This 100% cotton hat is made of lightweight cotton that protects your baby’s precious head from the sun while keeping them cool. Eriso also made sure to put the tag on the outside of the hat so it won’t irritate your baby’s scalp! We also like that the hat has an added sweatband around it to pull sweat and moisture away from your baby’s face. The brim is foldable and crushable, so you can take this with you anywhere you go! There is a drawstring chinstrap to keep the hat securely in place, but if it’s pulled or snagged it will easily pull open to prevent choking or injury. The hat comes in 6 adorable prints, so you can choose one or more to add to your child’s wardrobe! We also think these would make great gifts for a little guy or girl in your family!